‘Tis the season for holiday parties, gift exchanges, and get-togethers with family and friends. It’s all fun and festive, but makes for a very full calendar. If full scale holiday baking doesn’t fit into your schedule this season, then this is the recipe for you! 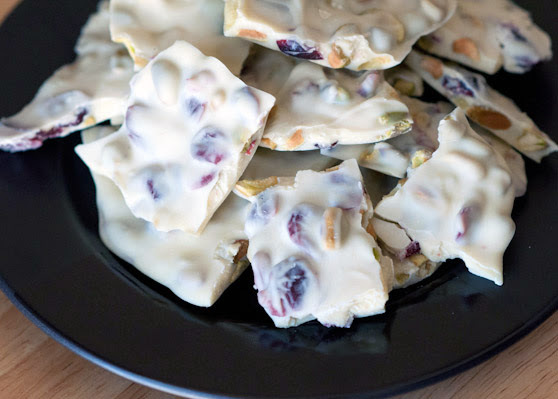 Made up of only three ingredients, this Pistachio and Cranberry White Chocolate Bark comes together in just a little bit more time than it takes to melt the chocolate. It’s an interesting twist on traditional holiday peppermint bark, with a creamy white chocolate base and festive flecks of red and green. It’s easy enough to make a few batches to keep on hand for gift giving, unexpected guests, and holiday parties. Everyone appreciates a little something homemade this time of year! Melt chocolate in a double boiler or glass bowl set over simmering water, stirring frequently. Once the chocolate has completely melted, remove from heat and cool slightly, stirring often. While the chocolate cools, line a baking sheet with parchment paper and set nearby. 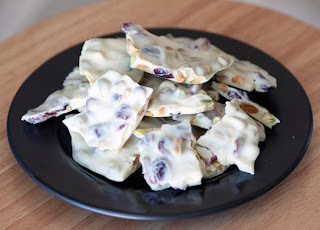 Once the chocolate has cooled a bit, stir in the pistachios and cranberries, stirring to combine well. Evenly spread the mixture on the prepared baking sheet to desired thickness. Transfer to the refrigerator to cool until set, about 45 minutes. When set, break the bark into pieces and store in an airtight container. To learn more about Springmoor Life Care Retirement Community, check out our website, and find us on Facebook.